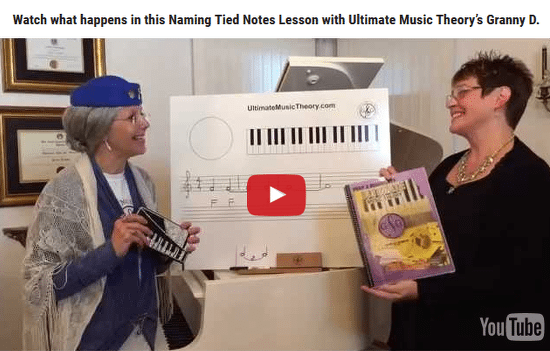 In my blog titled "Naming Tied Notes", we reviewed how to name tied notes. Did you see the video with Granny D? But what happens when there are tied notes with accidentals? How is the accidental affected by the tie? Does the accidental affect the notes after the tie? If we have a bar line through a tie, does it cancel the accidental? Do we need another accidental on the 2nd note of the tie? How do we name tied notes with accidentals? the note is only named when it is played (depressed). the accidental applies only to the note on the line or in the space in which it appears. the accidental is cancelled by the bar line or by another accidental. So - here is the confusing part: Does the bar line cancel the accidental of the tie? Yes it does - but only once the note has stopped being played (depressed). The rule for naming notes with accidentals is that the accidental applies only to the note on the line or in the space in which it appears, and only until it is cancelled by the bar line or by another accidental. The key here is to remember that a note is named only once at the beginning when it is first played, and the name of the note does not change for as long as the note is depressed (held down or being played). The note is only named when it is played (depressed). Correct. We hear 3 sounds - F (1 beat), F# (1 quarter note tied with another quarter note, or 2 beats) and F (1 beat). The accidental is cancelled by the bar line or by another accidental. Correct. The final note in measure 2 is F (not F#). It does not need a natural sign because the original sharp in measure 1 has been cancelled by the bar line. Naming Tied Notes with Accidentals - Tie or Slur? So, how do we know that this curved line is a tie and not a slur? Simple - the curved line is below the noteheads (written closest to the noteheads) and opposite the stems (if stems are ascending, the curved tie line is below; if stems are descending, the curved tie line is above). While the bar line technically does cancel an accidental, the "Power of the Tie" is stronger. (Insert dramatic Star Wars Type music here). The composer would put a natural on the second note of the tie. The composer would put the curved line above the stems, thus on the OPPOSITE side of the noteheads. Before I give you the answers, I just want to remind you that it is okay to have questions! When I have a student who questions a concept, my absolute favorite teaching tool is my Ultimate Music Theory Whiteboard. I actually have several (One Large Teacher Whiteboard and 3 Small Student Whiteboards) at each of my 2 studios. Sometimes I think that some of my students ask questions about concepts just to see me pull out the whiteboards. Yes, I am blessed with several "Why" students who are not completely satisfied until I have answered every "Why" or "Why Not" question that they can possibly think of. And, I think that the mission of a few of them is to "Stump the Teacher" - to find that breaking point where I run out of "answers" and scream "Blame Bach!" while banging my head into the wall and rubbing some "Stress Away Essential Oils" on my wrists, temples and the back of my neck. How did you do? Remember - making mistakes is not a "bad" thing. It is through mistakes that we learn what works for us and what doesn't! Thanks Melrose! I appreciate that so much! 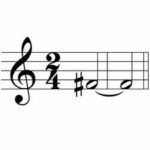 This makes perfect sense, but are you saying that slurs are written with the curved line on the stems and not on the note heads? I always thought they were on the note heads for both ties & slurs. 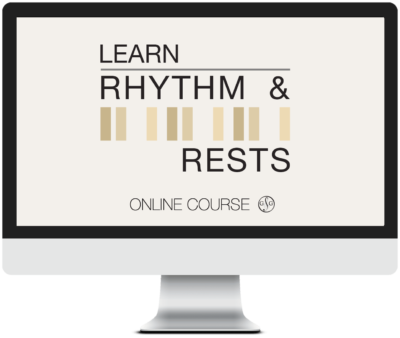 Slurs can be written with the curved line on the stems OR with the curved line on the noteheads. However, for the curved line to be 100% absolutely without a doubt a TIE, it must be on the notehead!